We’ve got a plan for 13.1 that will carry you from the sofa to the start line—and across the finish too! Time to get off the couch and move. Thinking of taking the 13.1-mile plunge but not sure where to start? We’ve got a plan that will carry you from the sofa to the start line—and across the finish too! You’re sitting on the couch watching television when inspiration strikes. You hear a woman on the news recount her story of going from feeling unhealthy and overweight to running a half marathon. You see the glow on her face and the energy in her body and suddenly you realize: This is it! This is my next goal. I want to run a half marathon! Then reality strikes. You haven’t worked out in months and you’ve got a little more around the waistline than you’d like. How can you run a half marathon when you can’t even run to the end of your block? Good question, and here’s a simple answer: You start from where you are, build up slowly so you enjoy the journey, and practice patience along the way. Here’s how! The Couch to Half Marathon Plan is all about flexibility. 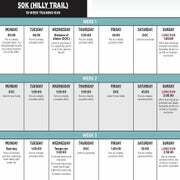 At first glance, you’ll notice that the schedule uses run-walk intervals. Although this plan lists specific intervals, feel free to adjust it to make it fit for you. You may be able to follow this plan as it stands, or it may feel too aggressive. If this is the case, simply adjust the intervals to include less running and more walking. Perform only the intervals that feel comfort-able for your body so that you’re able to cover the distance more safely and reach race day without injury. The run-walk workouts start with a walking warm-up (not listed in the chart), then alternate minutes of running with minutes of walking and ﬁnish with a walking cool-down. For instance in the first workout in week one, you run at a comfortable effort (just a bit quicker than your fastest walking speed) for one minute and then follow with two minutes of brisk walking and repeat that a total of 10 times. As the program builds, so does your running time. This plan builds to running two 10-mile long runs to prepare you for the 13.1-mile distance on race day. Why not go the whole way in training? Because when you push to run longer miles too quickly, your risk for injury skyrockets. Ten miles is plenty to prepare you well for a half-marathon race. It’s crucial to listen to your body during this process. If you’re struggling to finish a workout or have aches or pains, it means your body isn’t recovering properly. If that is the case, repeat the week you’re currently on, or keep the distance the same as the plan, but do more walking and less running. Whether you develop your own run-walk interval of choice or follow the schedule as is, by the end of this plan, you’ll be able to decide for yourself to run the whole way on race day or to use run-walk intervals to cover the distance. Both are great ways of racing, and it’s best to go with what your body allows! Always remember to have fun and keep smiling. You’ve got this! CLICK BELOW for each part of the training plan. 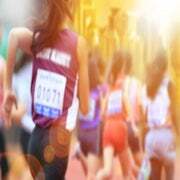 Within 20 weeks, you’ll go from thinking about running to crossing the finish line of a half marathon!